Kabbalah is a study of unseen reality and unseen potential. If we limit ourselves to experiencing the senses of the physical body we perceive only a fraction of the world that we can connect with, feel and know. Science has been an incredible tool to uncover what is beyond our normal senses. When early humans weren’t aware of the unseen they often succumbed to a lurking predator whether animal, viral or bacterial. We have slowly been able to put under the microscope or view through the telescope (and newer technology) unseen realities that were unfathomable just a few years ago. By doing so we have opened our perception; broader, wider and deeper. There is a tradition to sound a ram’s horn (Shofar) each morning for the month preceding Rosh Hashanah and on the New Year Day itself, there is a more extensive ritual of sounding the Shofar. My father had a prized possession: an elegantly shaped and almost translucent ram’s horn, pleasing to the eye but requiring great skill to elicit its sound. As for any musical instrument, there is a relationship between the player and the instrument. In my father’s hands, the blasts of that Shofar sent vibrations into my chest. I was hearing the sounds auditorily but I was feeling the sounds viscerally. Before last week I had never heard of cymatics—a field of science in which sounds are visualized in patterns. Put simply, you visualize patterns produced by the vibrations of sound. For a quick intro watch Evan Grant’s https://www.ted.com/talks/evan_grant_cymatics/transcript?language=en and in four minutes you will have the basics. Googling “cymatics” and “shofar” yielded only one incomprehensible link of someone demonstrating the vibrations created by shofar sounds. The experiment still needs to be done. This Rosh Hashanah we will explore what we see (feel) as we listen to the sounds of the shofar. 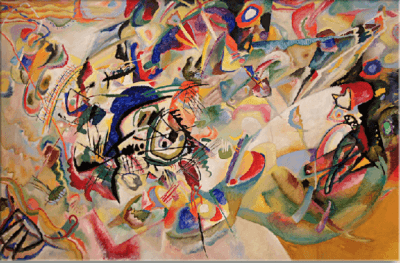 There is a puzzling statement made by the first-century mystic Rabbi Akiva commenting on a verse in the Torah that says that the people at Sinai heard the sounds (of the shofar) “they saw what is (normally) heard, and heard what is (normally) seen.” This joining or connecting of the senses is called synesthesia—a neurological phenomenon in which stimulation of one sensory or cognitive pathway leads to experiences in a second sensory pathway. Apparently, it was known some two thousand years ago to describe an experience of seeing sounds. The most common seeing of sounds, whether music or words, is seeing them in color. While there are many competing ideas about the origin of its name, perhaps the music genre “blues” was so called because the rhythms of those African spirituals translated for those who had synesthesia into the color blue. Sound as color may sound a bit strange but we now have solid neuroscience backing up this human capacity—people see red not just when they are angry, they see all kinds of colors associated with sensory input. Wishing you all colorful sounds and patterns of beauty from the vibrations you send and receive. In the new Vincent van Gogh biopic At Eternity’s Gate, the artist and filmmaker Julian Schnabel doesn’t merely want you to see the increasingly volatile van Gogh (Willem Dafoe) but to see what van Gogh sees and to feel the painter’s fever — his lust not just for life but for the presence of Eternity (or the Divine or Name Your Higher Power) in the colors and shapes of this world. As an act of sympathetic imagination, the movie is only partly successful, but that part can take your breath away. The images vibrate with emotion. It should be admitted that they vibrate largely because the camera is handheld and its operator is trying to whip himself up into a Dafoe-like frenzy. But the actor — constantly in motion behind his sad, hollow eyes — is infectious. He looked, to me, so uncannily like one of van Gogh’s self-portraits that I was surprised to go and reexamine the works and discover that Dafoe’s actual features (minus the red hair and beard) bear little resemblance to the painter’s. Dafoe just seems in his marvelous actorly way to be channeling van Gogh’s tipsy, questing, endlessly dissatisfied spirit. Dafoe (and Schnabel) plainly understand that this man who could be violent and who did, after all, slice off his own ear (though he never could remember how or why) had an essentially gentle soul. Oscar Isaac’s thinly written Gauguin has a key speech when he tells his friend that “the Impressionists are over — Renoir, Degas, Monet, they represent only themselves.” This van Gogh is looking hard at color (primarily yellow, in the film) as if trying to tune into — and match — the vibration of its molecules. He might well be grouped with the Impressionists (he’s technically a Post-Impressionist), but he wanted to capture not what he felt but what is. At Eternity’s Gate charts van Gogh’s loopy odyssey from Paris to Arles — Gauguin advises his impoverished friend to go off and find “new light” — and in and out of sanitaria. There are wonderful scenes in which Dafoe’s van Gogh stumbles through the countryside, setting up his easel whenever the colors stir something in him. Schnabel isn’t aiming for lyricism but for a rough, even abrasive texture. Tatiana Lisovkaia’s score consists mostly of piano keys struck hard with the occasional moody slash of violin. Handmade, the movie is, like the paintings dashed off quickly before the emotion dissipates. Schnabel has had practice getting inside his subjects’ heads, most successfully in The Diving Bell and the Butterfly, in which he re-created the paralyzed protagonist Jean-Dominique Bauby’s constricted universe from the inside out — an act of sympathetic disjunction. But in that case he had a fine Ron Harwood screenplay closely based on Bauby’s memoir (dictated one letter at a time via one fluttering eyelid). At Eternity’s Gate has strikingly clunky dialogue by Jean-Claude Carrière, Louise Kugelberg, and Schnabel. Even grading on the artist-biopic curve, the exchanges with Gauguin are flatfooted. The rapport between van Gogh and his brother (and sometime benefactor) Theo (Rupert Friend) is only slightly more human. The exception is a scene between van Gogh and Mads Mikkelsen as a priest who oversees the sanitarium in which van Gogh spends time in his final years. It is touching how gravely and tenderly Mikkelsen’s priest speaks as he directs the artist to examine one of his own paintings: “Look carefully, please … Don’t you see that this painting is … unpleasant, ugly?” Mikkelsen is so good that you can almost view the painting in that way, as a childish product of madness instead of a revolutionary masterpiece that would one day sell for approximately 50 million times its worth in van Gogh’s short, generally miserable life. I’m not a fan of Schnabel’s paintings, but I think he’s a born film painter, and even if At Eternity’s Gate doesn’t reliably cross the blood-brain barrier, his frames are like no one else’s. (His cinematographer is Benoît Delhomme.) He will never take a light source for granted or let a face seem ordinary. As shot with his quivery camera, the rooms and furnishings have blurred edges that evoke van Gogh’s determined avoidance of definition. I’m not sure I can forgive Schnabel his final scene, however, in which van Gogh’s body lies in state in the middle of his paintings, on which wealthy mourners now bid. Having made his fortune in a very different kind of art market, Schnabel really has no place mocking the fickleness of patrons. This is what the critic had to say about the movie…but I saw so much more. Van Gogh,in the movie talks about seeing angels. He had the gift of synesthesia…he saw god in nature and saw the vibrations in color and felt the urge to paint what he saw in his own mind. He was shot to death in the end. He painted 72 pictures in the 80 days before his murder. He also said that he was painting for another generation, who would better understand his words of art. He said that his father was a minister and that Van Gogh realized that Christ was not well known in his day,except for a few disciples, and 70 yrs after his death the gospels were completely written. I did not care of the critique as I saw so much more in the movie…Dafoe did an excellent job…Lovely and amazing movie…about a genius who was so mocked and ridiculed in his day…so sad and disturbing to see others place this gentle giant in such a narrow box.